The cost of living continues to rise in America and this great golden state of California is facing the hugest housing crisis in decades. California renters pay 40 percent more than the national mean, yet the state’s median household is only 18 percent according to the Public Policy Institute of California. he 1995 Costa Hawkins Rental Housing Act which places limits on rent control ordinances, without rent control, landlords can continuously hike up rents causing displacement and homeless is to partially blame for this. Luckily, with the fight from tenants groups, local organizations and public figures a possible positive change may come to this state as a whole. Proposition 10, which will be on the election ballot this year would repeal the dubious 1995 law removing the current restrictions, and give cities and counties the power and ability to implement rent control as they choose. Although voting yes on prop 10 would not enact rent control for everyone, it would return the matter for localities to decide. 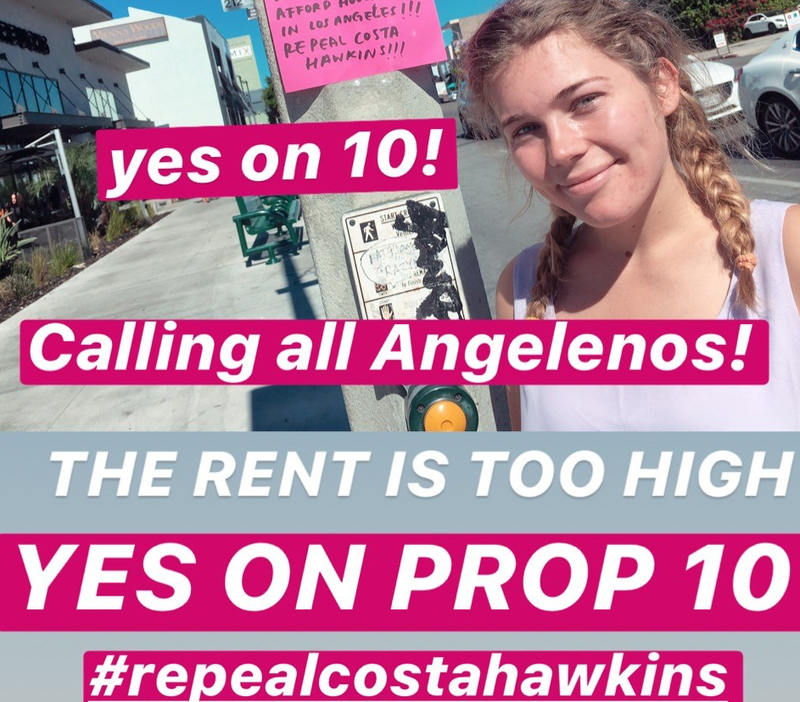 Voting no would keep Costa Hawkins and California would continue to struggle with its housing crisis, despite efforts from tenants rights groups and local residents/renters. You would think, if one truly cares about their constituents, wouldn’t they want them to simply enjoy living where they are and not constantly struggle to make ends meet. This all would be so great but there is an issue, and like many, money plays a key factor in why this great proposition could be brought down. The amount of money spent on the yes on 10 advertising compared to no on 10 is at a disadvantage. While $64,316,181.77 endorsed by extremely wealthy developers and real estate agencies is fueling the no on 10 campaign, polluting our airwaves and tv channels. Only $25,079,368.57 (mainly endorsed by the AIDS Foundation) could prevent the people from knowing the importance of voting yes on 10. This goes to show that even though more people support this proposition, we still must keep spreading the word to residents and renters on the importance of voting YES. How can I help spread the word and get involved? I have been making my own yes on 10 signs to post up around the city, other concerned Angelenos have too! Yet that does require more time, than a quick post about why its important to vote Yes on 10 on your Instagram or snapchat story. We all have the time to send a morning tweet on the train to school, don’t we? Spread the word! Attend a LA Tenants Union Meeting! Mobilize and Organize to canvas yes on 10 in your neighborhood! You never know the impact you may have on someone life, voting yes on proposition 10 could the reason why an Angeleno is sleeping in a bed instead of a tent.